Fanari Villas hotel is built at the edge of Oia village. Thanks to its location (a few minutes away from the village centre), it offers the relaxing atmosphere everybody needs during their vacation. Fanari Villas has been decorated in a unique santorinian style using the volcanic lava and the "Santorinian earth" as basic building materials. The complex is 180 metres above sea level, under the famous Oia windmill, on the side of a steep cliff, at the base of which the small port of Ammoudi lies, where you can taste fresh fish & sea food at its picturesque tavernas. Fanari Villas can easily accommodate from 2 to 4 persons with their traditional bedrooms (double or twin beds) and living areas. Both the kitchenette and the bathroom maintain the same Santorinian volcanic architecture, while equipped with modern facilities. Some of the bathrooms have showers and some simple bath tubs or Jacuzzi ones. Each one of the villas has its own private veranda / terrace, overlooking the volcano. The suites of Fanari villas are villas with Jacuzzi bath tub. CD player, slippers bathrobes and other luxurious amenities are provided. Upon arrival champagne, fruits and fresh flowers will be waiting for you at your suite. A laptop can be provided upon request. Santorini Suite (2 persons) consist of one double bed, open living area included the sleeping area or separate living space from sleeping area, terrace, wine (upon arrival). Fanari Junior suite (2 persons) consists of one double bed, and one with two twin beds, an open living space where the sleeping area is located too, a bathroom with a Jacuzzi tab. Bathrobes, slippers, hygienic amenities, lap top (upon request), terrace, wine, champagne, flowers and fresh fruits (upon arrival) are also offered to guests. Fanari Senior Suite (2 persons) consists of one double bed, a spacious open either both living and sleeping area or a separate living space from sleeping room, a bathroom with a Jacuzzi tab and a private terrace. Guests are offered bathrobes, slippers, hygienic amenities, lap top (upon request), wine, champagne, flowers and fresh fruits(upon arrival). Executive Suite (2 persons) consists of double bed, spacious open living area included sleeping area or separate living space from sleeping area with mini outdoor heated Jacuzzi, with bath tab or shower in te bathroom, bathrobes, hygienic amenities, slippers, lap top (upon request), private terrace, wine, flowers and fresh fruits (upon arrival). BELLS honeymoon suite (4 persons) consists of two double beds in a cave and on a loft, a whirlpool bath tab in the bedroom and shower in a bathroom, an open living space, a private terrace. Bathrobes, slippers, hygienic amenities, lap top (upon request), champagne, fruits and flowers (upon arrival), a free of charge mini bar consumption and daily fresh fruits are offered to guests. SUNSET honeymoon suite (2 persons) consists of one double bed, a spacious open living space separated from the sleeping area, a bathroom with a whirlpool bath tab, a private terrace and an outdoor heated Jacuzzi. Bathrobes, slippers, hygienic amenities, lap top (upon request), champagne, fruits and flowers (upon arrival), a free of charge mini bar consumption and daily fresh fruits are at guests’ disposal. FANARI honeymoon suite (2 persons) consists of one double bed, a spacious open living area including the sleeping area, an indoor heated Jacuzzi, a bathroom with a whirlpool bath tab and a private terrace. There are also bathrobes, slippers, hygienic amenities, a lap top (upon request), champagne, fruits and flowers (upon arrival), a free of charge mini bar consumption and daily fresh fruits. 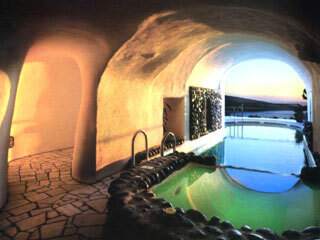 The fresh water swimming pool is half open and half cave covered and it has its own Jacuzzi/whirlpool area. From the pool bar you can enjoy fresh fruit cocktails, delicious ice creams and refreshments. On the sun terrace there are umbrellas for the hot days of summer and sun beds for relaxing and improving your sun tan. Of course pool towels are available during your stay. On the terrace, in the main snack bar, under the reception, you can enjoy your special Santorinian breakfast, your light lunch or your evening "aperitif" accompanied by light snacks, while enjoying the everlasting Santorinian sunset.